For those born in the month of April, you are lucky enough to have the shimmering diamond as your birthstone. The word diamond is derived from the ancient Greek word “adamas”, meaning invincible. Thought of as the ultimate gemstone and coined as a ‘girl’s best friend’ the diamond is a symbol of innocence and courage. Diamonds are made of crystallized carbon, making them one of the hardest and most durable substances on earth. Diamonds can be found in almost every colour including yellow, red, pink, blue, and green. Blue, black and green diamonds are arguably the most valuable, with yellow and colourless stones perhaps the most popular. 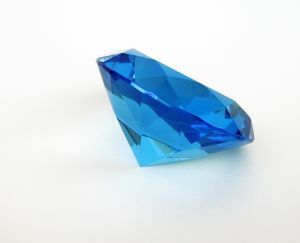 Usually the more saturated the colour of the diamond, the higher it is in value. Diamonds are found in countries including Brazil, Russia, and the USA; however South Africa remains the top producer. In all cases, diamonds are formed deep within the earth, in temperatures that reach around 1500 degrees centigrade, brought to the surface through volcanic eruptions. The first references to diamonds have been discovered in Sanskrit texts, written before 400BC. It is thought that at the time, ancient groups from India assigned a great deal of value to the stone. Ancient Greeks also held the diamond in high regard, and according to legend they believed that diamonds emerged as tears of the gods, splinters of stars, or crystallized lightening. The diamond has been used in physical healing since the Middle Ages. Its ability to unite the body and the mind can help to prevent cardiovascular diseases, treat allergies and detoxify the body. The diamond has also had great influence on spiritual healing, and in particular meditation. Its calming influence cleanses negative emotions, bringing about positive mental clarity. It is thought that the diamond is able to reach deep into us, opening more spiritual doors than any other stone. Though many choose to wear diamonds for their great spiritual properties, the diamond has arguably become one of the most popular crystals to wear set in jewellery. A symbol of elegance, class and beauty, the diamond has many notable wearers. Queen Elizabeth II, born on April 21st is known for her extensive diamond collection, and often decorates her outfits with diamond necklaces, brooches and tiaras. The diamond has long held the centre stage in popular culture, due to its natural strength and beauty. If the phrase ‘diamonds are a girl’s best friend’ rings true with you or a loved one, celebrate in style with the gift of the world’s most adored gemstone. The diamond can be found in all different types of stunning jewellery, but it could be argued that the engagement ring is unrivalled in its popularity. Signifying commitment, trust and fidelity, the diamond ring brings love and clarity into partnerships so if there is a special someone in your life born in the month of April; why not take the chance to combine their birthday with a proposal! If you or someone you love was born under the diamond this April we would like to wish you a very Happy Birthday!